Café Rouge Leicester is set within our Parisian restaurant design, take a seat in one of our beautiful banquettes with your favourite vin rouge and enjoy the authentic feel of your local bistro. outside seating area for a spot of al fresco dining. Located on the lower level of the Highcross Shopping centre, close to Cinema de Lux, House of Fraser and John Lewis, the restaurant is the ideal place to grab a coffee, a quick bite while shopping, or enjoy a longer, more leisurely lunch with a glass of wine. 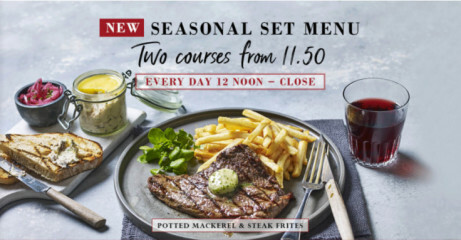 Discover our new seasonal menu with complimentary Prosecco!